Manufacturer: Gerstner & Sons Inc.
Last November I placed this bag in use. It still is not full but I have managed to load it to 70-80 lbs. This bag carries all of the immediate hand tools I use. This bag is rugged, well designed, roomy and has lasting value. It still maintains its' shape even with a heavy load. Turn it over, drop it or kick it around; it still keeps its shape, the zippers funtion great and nothing inside is damaged or falls out. Great product and I will probably order another just to balance out the weight of the contents. I'd give this bag 5 stars for the fact that it's built like a brick SH, you get mucho durability for your money. But I returned mine. The shipping weight alone should have tripped a circuit in my brain - 8 lbs! This is a heavy bag. 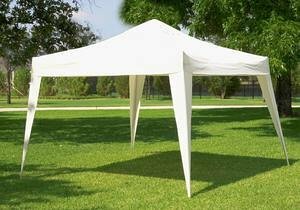 If all you do is lug this from the tailgate to the jobsite - say 30 to 50 ft - you'll love it. It'll outlast you. But I work in NYC apartments and haul a lot of what I have to use to the site - and up many stairs. 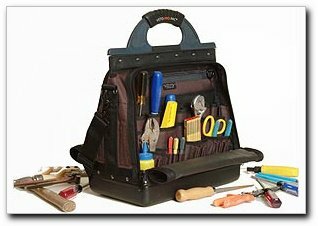 Plus, the design of this bag begs to be loaded with all the tools you have - even the ones you don't need or use anymore. When it arrived, I had an epiphany...I need 3 or 4 bags (lighter bags) loaded with specific tools for specific jobs - take what I need, leave the rest. If it fits your style of work I'm sure you wouldn't be dissatisfied with the Veto bag - but it wasn't for me. I wish the company made a bag that was ½ to a 1/3 the size/weight. I'd keep that one. Heavy duty and shoulder strap makes it easy to carry for long distances. Plus the various sized pockets inside are great. I still recommend using a small utility box for screws and such,which can easily fit inside the bag. There is only one complaint that I have. There is no max weight limit and considering the size of the bag I easily had 45lbs. of tools that I was carrying which eventually cracked the handle on top of the bag after a year. This was a minor problem as I repaired it with heavier duty material. I still highly praise this bag. Received this bag several weeks back and have been using it on the job with great success. I used to haul tools around in two individual bags and always had to "fish" for the item needed. This one bag holds everything my two other bags held but now there is more than enough room for additional hand tools and they are much better organized. I have yet to "fill up" this new bag and I can carry it with one hand; this bag is much better engineered. I hope the guy that perfected this bag is working on other new innovations; I am anxious to see his next idea. I purchased this item for my husband and he couldn't have been more pleased. The deep pockets held all his tools securely with room to spare. 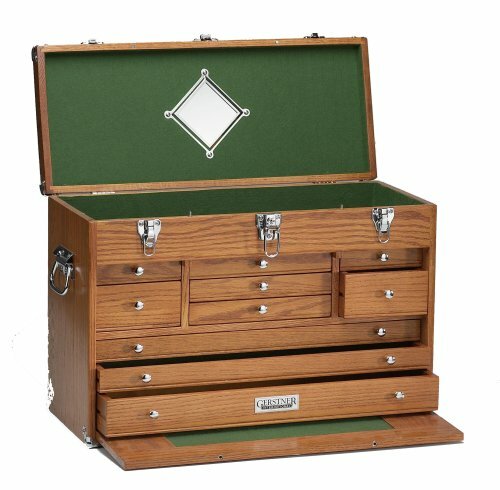 He said it is the best tool organizer he ever had. Then he tossed his toolbox. :) I have since bought several of these for different male birthdays, all with the same results. Excellent!! Note: Bucket Boss is extremely sturdy. The canvas and seams are very well put together. You can load this up with no worries. At first I bought this as a novelty. Not realizing that it was to change the way I organize my workspace. Normally I rely on peg boards in my shop to house the usual screw drivers, hammer, and frequently used tools. The problem with that is that they don't usually get put away, unless I do a complete shop clean up. Which is why I have to go looking for them. My number one pet peeve is looking for stuff. Not only is is wasted time, but it interrupts my work flow. 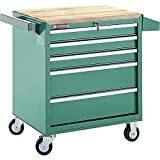 Now I use the Bucket Boss 56 Organizer to house all of my most frequently used tools, and I bring my tools to the work. I also went to Sears and bought an INEXPENSIVE red metal Utility Cart that has four substantial wheels in a shopping cart configuration (two fixed, two universal) and they all lock, with a tray shelf at the bottom, and one at the top. I put the Bucket Boss in the bottom tray, which only takes up part of the lower tray space. In it, is everything imaginable, and after using it for awhile, I know right where it is. The best way to get the work flow going, is to be able to grab what you need, when you need it, and it is there every time, and have a place to rest it, or immediately put it away. With this combination, I roll the tools over to the work area, and I have an upper shelf to set things on during the project. It wouldn't be possible without the bucket boss. 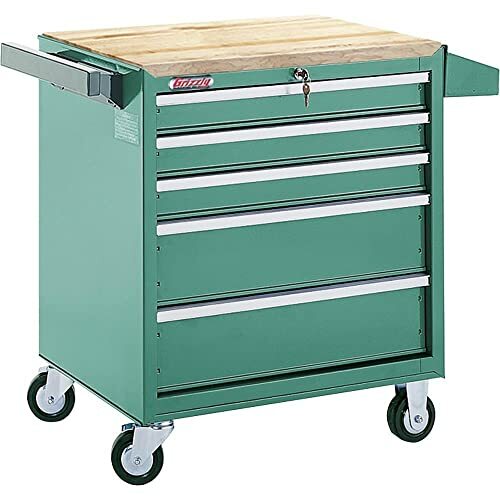 With mechanics tools, we use a multi-drawer tool box. Since everything is hidden, it takes some time to learn exactly where everything is. With the Bucket Boss, you have a reminder, everytime you glance at it. My only complaint is that their are so many pockets I can't justify buying another one. :-) That's how much I like this thing. Knowing that I can simply lift the bucket boss out of the bottom tray using the handle that comes with the bucket, and take it with me no matter where I go, gives me the mobility, and organizational system I use in the shop and on the go! 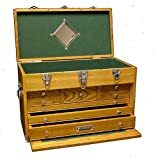 One system, one set of tools, for all locations. The cart is so light, I wouldn't hesitate to take it along as well. By the way the Bucket Boss does not come with the bucket, but considering the cost of a 5 gallon white plastic bucket at [the store], that is not a major item. I know it would probably cost more to ship the bucket than it would to buy one locally. So it makes sense. For on the job, it makes a very good impression. It looks organized. Combine this with one of their parts organizers, and you will not only, not have to go looking for your tools, that washer, locknut, screw, bolt, or anything else you want, will be at your fingertips as well. No having to run back out to the truck everytime I need a bolt, or nut, or screw, etc. I can tell you it is made out of great material that will last for a long long time, or that the pockets are multi-sized and shaped to fit near anything you may use, but what I really want to tell you is that this thing is engineered. Engineered to simplicity. That makes it one of the most frequently used pieces of equipment. It is great because it works. Not just because it is very inexpensive, for all of the utility, you will get out of it, but because it works, and works well. Get into the Boss and watch your productivity zoom! who gets custody if we divorce??? I love this tool organizer!!! I bought it for my husband for Christmas because I thought it looked cool. He didn't seem interested in it, so I took it and began using it for my own tools (we each keep our own set), and then he fell in love with it too! I was continually having to go find my tools because he had swiped them, bucket and all. So I went to Home Depot and bought him a bucket organizer they had in stock, different brand. A week later he's whining about how he likes mine better, so since I bought it for him in the first place, I switched with him and now he has the good one. I think I need to order a second one because he's right -- the other brand is not as good as this one. Damn good thing I love him so much, but if we split, I want custody!! This is a great product. I purchased this just because it is pink! This is a solid body storage building exactly as advertised. My goal was to store a mower, trimmer, blower, gas and miscellaneous items. I had to build a shelf (not included) notch it to fit and install it before putting roof in place. It works great for gas and miscellaneous items leaving room for taller items but they must be tilted some. If you have a mower with retractable handles (which I do not) it will fit in this building. (So mower is still out) Other than that it has cleared up the mess in the back and locks the flammables up too. Be careful to read instructions because it would be very difficult to take pieces apart after clicked into place. If you are planning to store a mower I would recomend a larger unit just for ease of use. 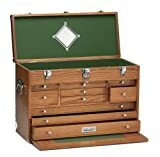 This one is great for a lot of gardening supplies but I think they should provide at least 2 or more shelves. You can put up to 6 shelves inside to fully use all the cubic space available. But you may just need 4 and leave the lower two open for big size items to be stored. Rubbermaid has a similar size shed but it can only accept three shelves and waste a lot of spaces. The Rubbermaid shed uses much fewer pieces to assembly than this one. The assmbly is pretty easy if you follow the manu but it does take some time (1-2 hours). After I finished the assembly there were some rain and the inside was try except a couple of water drops. The only concern is its sturdiness since it's assembled with 28 pieces and so far so good. I don't expect it can stand a ternado or hurricane. One thing I wan to alert you: when you buy the shelves do measure the inside and ignore the manu since if you buy the side according it yuo will find the shelves will shift too much to the left or right. You want them more stable, right? Padded suspenders w/cell phone pocket -Easy on the body and keeps the phone at hand. Hip support pads - Extra waist comfort. Built-in Meathook Cordless Tool Holder - Keeps that cordless tool ready to use. 1680 denier fabric - Will wear forever. Mullet Buster? Interesting name - great tool belt. I bought this primarily because of the padded suspenders. I don't like standard tool belts which fall down after a while unless you tighten them up well, which doesn't feel comfortable to me. The suspenders put the weight on your shoulders which works better for me. It also looks impressive! An insane amount of storage pockets are on this belt, and the cell phone pocket on the suspenders (which do come off by the way) is handy. It puts the phone closer to where you can hear it. I used to hate never hearing my phone when strapped to my waist in an noisy environment. Actually, there is a second phone pocket around the waist area, which is handy if you have a cell phone and a 2-way radio, you can protect them both. Clever! 7. 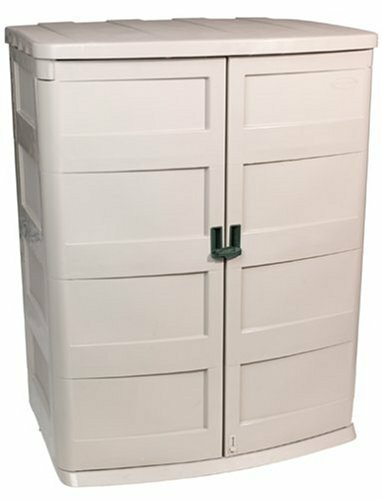 Rubbermaid 3747 Horizontal Storage Shed 32 cubic feet. This cart is perfect. i got one as a gift from my kids last christmas, and i can't imagine doing yardwork without it now. The drink holder comes in quite handy too.. no more turned over soda cans in the grass. A small feature on this produc. but handy. I didnt' think i needed a wheelbarow with a motor.. but this is really a great help for me. I'd recommend it to anyone who likes to garden but hates the hard work associated with it. i love mine.. I just got this a week ago...assembled in about an hour, goes together well. I have been using it in the garden, and it lets me do things that exhausted me previously...I am somewhat weakened because of surgery last year, and a regular wheelbarrow is really hard to handle. the LUV makes all things possible - planted two big plants today, and used the LUV to haul the un-needed dirt from the hole to the dirt pile. also, carry all my tools to the site in the LUV so that I don't have to go back to get anything. LUV the LUV. don't know what I would do without it! just checked to make sure that it seems popular, because if there is any chance the maker would go under, I would buy a backup LUV (ie, an extra). however, looks like it is being sold in more and more places, and I cannot imagine any senior citizen (like me) going without it. I just got this cart and I think it is already worth the money. I had a truck load of mulch and hills to go up with it. The cart went up hill with no problem. Dug up huge clump of zebra grass so heavy I couldn't lift it. But just rolled it into the cart pushed the control and away we went up hill to woods, dumped not a problem. I think this thing is great for an older person like me when you can no longer do the heavy stuff. I LUV it. I highly recommend this product to anyone doing gardening or yardwork. It was so wonderful to have some help spreading 20 yards of mulch, it was actually a pleasure. Instead of some dreaded yard work, I now look forward to other garden chores with excitement. 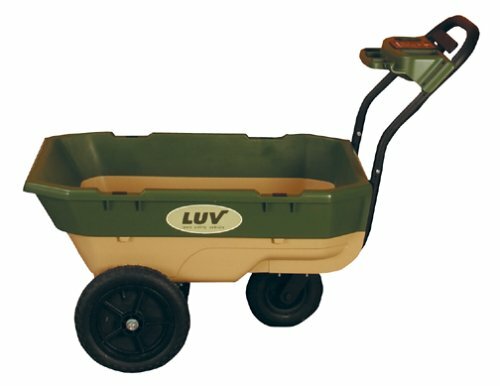 I don't know what I would do without my LUVcart. This item saves me so much time, I must waste 2 hours per weekend looking for the tape measure, pencil, hammer, or whatever that I layed down somewhere around here. 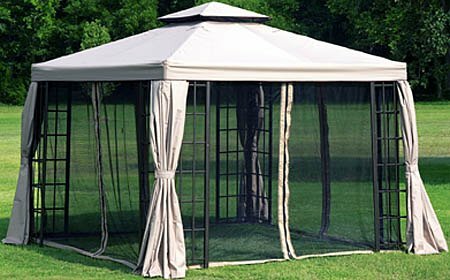 It is well constructed and stands up to the rugged use that home projects sometimes call for. You can load it up or leave it light. I'm actually thinking of getting another one so I can have one setup for General Maitenance and another setup for specific projects. So now I'm always ready to tackle that Honey-do list that is now up to three pages long! The bib material is A OK but the quick release buckle was of very poor quality and will not stay closed. I am currently looking for another buckle that I can have someone with a heavy duty sewing machine will replace. I had the lesser version until the hammer loop broke, then I ordered the 'Big Dog'. I found this version to be much better. 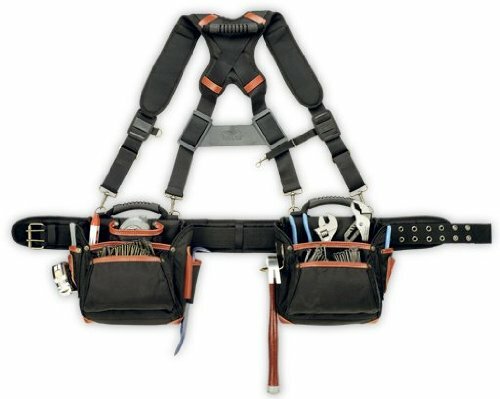 There are two hammer loops, multiple screwdriver pockets, six big pockets, and adjustible straps. This apron is easy to put on, and take off. When, and if, this apron breaks, I will quickly purchase another. If you are used to a belt, this will take some time to get adjusted to, but it is far superior, for small jobs. As a carpenter at a psychiatric hospital I need to keep my tools close to (if not on) me for obvious safety reasons. 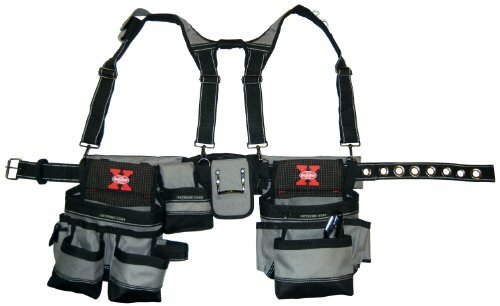 The pockets, and dual hammer loops keep all the tools, parts, and fasteners I need at hands reach. It also helps you work more efficiently (think of all the time you spend picking up individual tools set on the floor etc.). I have purchased more than a half dozen of these fine aprons, but I haven't worn out any of them. These things wear like IRON! Unlke those other cotton work aprons that mysteriously morph into "baby bibs" upon their first experience with a washer/dryer, these duck aprons merely get softer and more comfortable this each cleaning. I pick up another one as they become too unslighlty for the hospital appearance standards from my wiping paint, caulk and construction adhesive on them. I recently gave 2 of my older aprons to an appreciative couple of friends who are doing the total house rehab thing. They wonder how they ever operated without them! If all products performed as well as this it would be a better world! I purchased three bags about two years ago.I liked them because you couldn't tip them over. Alot of guys in my company were also using them. Unfortunately, a house I was working on burnt to the ground and took my van with it. When I went back to the site the next day to make a list of matl's for the insurance company, I noticed the bags had their carrying strings burnt off and had fallen from their hooks upside down on to the van floor. I turned them over to find them sealed tight from the heat, with almost all contents intact. Unuseable now, but they did their job right to the end! 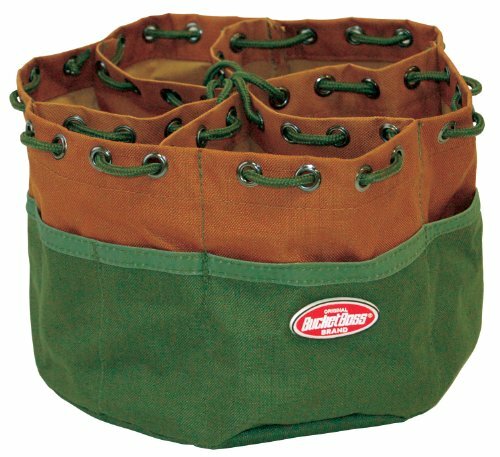 I have a number of the original Bucket Boss chutes, so when I saw this unit with the external pockers- a natural extension of the idea- I picked up a couple at the local home store. I'm not a builder, but I've worked with crews on my house and done a fair bit of repair and addition of small built-ins. Like anyone who's done this sort of work, I have accumulated large amounts of screws, nails, wirenuts and other hardware in various sizes that I need a handy way to carry. Three or four of these (depending on what's in 'em) will fit in a joint compound bucket and provide an excellent way to organize and carry small parts. I've got two filled with different sizes of deck screws, one with biscuits for the biscuit joiner, one with wire nuts, cable staples and other electrical items, one with nails and a few more with different screws, nuts, washers, screen door hardware, fuses, and other things I can't even remember. It's a great system. The best way to get into the Bucket Boss Super Chutes is to explain it is part of a system. The super chutes handles the misc parts. The other part of the system is the Bucket Boss 56, which handles the tools. Each one, can also be used to do a little of the other. Super Chutes is great. I no longer find myself looking for that box of screws, or having to run back out to get things out of the vehicle. Also, if I am low on something, it is immediately apparent. The material, it is made out of, is super durable, and I am sure it will last, for a long,long time. Pick up one or more of these, and a 56 Organizer for your tools. The organization will pay for itself in no time. Get the Boss and watch your productivity zoom! What a great bag! I have a few quibbles; as noted, the inside pockets are a bit tight. The zipper tab doesn't seem to match the heft of the zipper. The exterior pocket flaps should be a bit wider/broader to cover the pocket and the gatemouth design seems to balk if you stuff the bag. All minor. Well constructed overall and every bit worth the price. A reasonably lightweight bag that holds a decent amount - of course, you'll cram more into it than you can comfortably carry. Because it's a medium/long bag you have to balance the load - otherwise it dips - and why no shoulder pad? I personally wouldn't recommend the recip saw w/blade in the bag. I once tripped and landed on a nylon bag w/ a jigsaw - blade in thigh - ouch! No more. Blades off all saws (except circular) and hard cased for transport. I like this bag a lot. This bag is very durable and practical for hauling around your cordless tools. I use mine to hold my Milwaukee 18 v cordless saw and drill as well as a D-handle Makita router and various hand tools. They all fit nicely. Three pouches on the outside each can house an 18 v battery. There is a sturdy divider that velcroes on the inside and several small tool dividers for nail sets, pencils, blades, etc. The bottom is nicely padded and the shoulder strap is rugged. I can't carry what it can hold! Man, these bags are great! I fit a lot of my personal tools in here and had to take some out because the whole was too heavy! I love the durable cloth; I love the shoulder strap; but what I like most is the use of space. There is a neat set of straps on top for a 2' level. 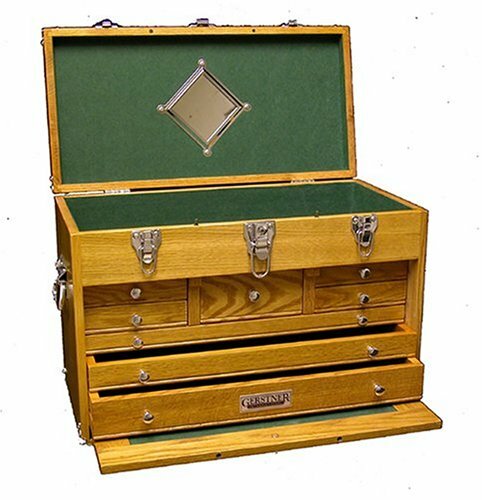 There are organizational pockets on the inside for pencils, chisels, and whatnot. a great place to congregate protected from the sun. Crafted from super tough, double layered 1680 ballistic nylon and Top Grain Leather. 8 main reversed nail/tool pockets. 17 smaller pockets fit pliers, nail sets, pencils, knife, etc.